So far the experiences that i have gathered volunteering for mozilla , had never been so awesome . Probably what i experienced on 23rd may , 2014 can be counted amongst the best times i had in my life ! And why it won’t be ? We actually took one step further to aware and inspire female folks of our community to come out of the cocoon and make a difference in the statistics of FOSS and techs. I thought out of the CTG WoMoz Tech Fest initiative early in February when i was an FSA and really wasn’t aware if an event like this would be possible to arrange . Details can be found here . I planned it a bit big actually , Thinking of an National all female App day and hack day where women through out the country would participate but there was a bit dilemma as our initiative WoMoz BD was very new. 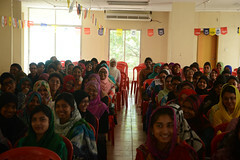 So we separated the plan into major divisional tech fests which was planned to be initiated with CTG WoMoz Tech Fest. We had three volunteer’s meet-ups to plan and distribute duties of volunteers. 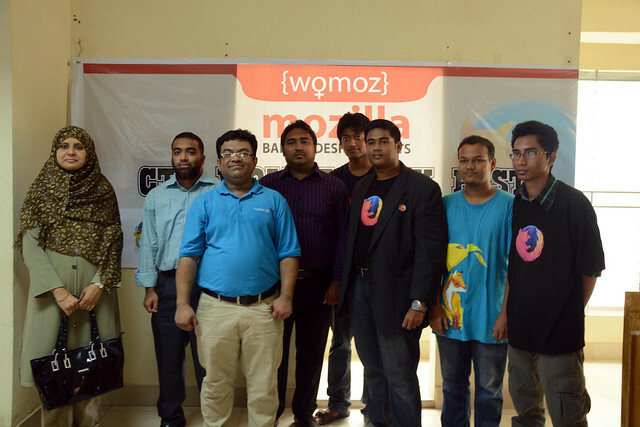 The first volunteer meet-up was held on 11 th April , 2014 entitled “Open Q/A MozHour and CTG Womoz Tech Fest volunteer meet-up#1” . Then the second volunteer meet-up was scheduled on 12th May , 2014 entitled “CTG Womoz Tech Fest Volunteer Meet-up #2 ” for reassessment and discussion on success scenario of the duties assigned and calculation of the tasks pending etc . We executed our promotional activities by postering , launching promotional video and inviting 20 reputed educational institutions of Chittagong (CTG) from 15 th May , 2014 to 20 th May , 2014 . The final meet – up was planned on 22nd May when we finally checked and cross checked all the PCs of the labs , checked power supplies , ensured power back ups , have the new firefox , firefox OS Simulator , ADB installed in them beforehand to ensure a congenial environment for the participants. Our local FSAs Raju Meaji , Towfique Anam Rine , Navid Ahsan volunteered for this task. We also distributed the tasks of the volunteers and supplied them their duty regulation chart with event plan . Our App dev TF lead Rahid Hasan gave a general overview to the field facilitator volunteers of App train session and webmaker session . You can find the details in the respective blogs linked up. 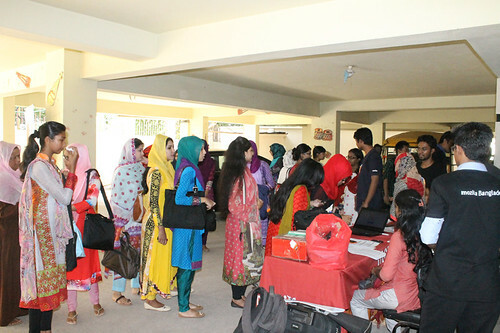 FINALLY 23rd May , 2014 came , more than hundred female participants from 18 different educational institutions including Universities , schools , colleges came together to hack the web using open standards ! Chittagong Independent University’s Proctor Rashid Ahmed Chowdhury , lecturer of CSE faculty Mohammed Arif Hasnayeen and MD. Mahmudur Rahman from International Islamic University Chittagong , Lecturer Nayan Debnath from Port City International University , Lecturer of CSE and EEE faculty Sanjida Sharmin and Samiul Alam from University of Science and Technology Chittagong , lecturer of CSE faculty Priyam Biswas from Chittagong University of Engineering and Technology were present to encourage our participants. We opened the registration line for the participants in April , 2014 and marked the finishing line to be on 20th May, 2014 . During this period over 260 registrations were received but due to having limited seats we couldn’t accommodate all and thus followed first come first served method in selecting participants . Participants were confirmed in two phases . We contacted them over phone first , then we sent out confirmation and instruction mail to the participants with full event plan , session details . The selected and confirmed participants started reporting in the check in booth from 8:30 AM which continued up to 9 :30 AM . There they collected their breakfast , guidance and direction . The whole process of participant selection and participant confirmation was lead by our awesome womoz volunteers Naima Sultana , Sumi Khatun and Rahima Siddiqa Zimmeem . 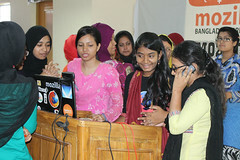 Later on Mozilla Bangladesh community lead Mahay Alam Khan gave an elaborate overview on open source , mozilla , mozilla’s mission , mozilla’s pathways , mozilla Bangladesh community in his key note speech . Keynote Speech session was followed by the Demo Booth and Photo Booth Session. 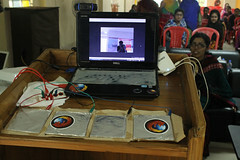 Starting from 12 PM to 1 PM .We displayed and demonstrated Firefox OS powered Geeksphones KEON and PEAK in the Demo booth . But in the photo booth we used Web RTC to click instant photos which created a buzz in the crowed ! Find more photos in the flickr album below . Then we had a prayer break and lunch break . After that we started our two technical sessions parallely . 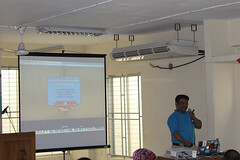 More than 70 participants participated in webmaler session . This session was lead by Mahay Alam Khan . Local FSAs Imtiaz Noor Peal , Ananda Das , Akramul Haque Yeasin , Shamsuzzaman Sadi helped out the participants as field facilitators. The participants of this sessions were given the ideas of basic concepts of web , the way we’re trying to convert the web users into web makers , concept of using webmaker tools . Later on they remixed some makes using thimble , had fun learning with x-ray googles and popcorn maker. 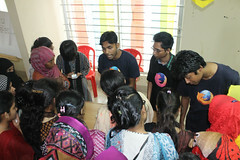 Another session was on Firefox OS app train which was lead by Rahid Hasan . Over thirty participants participated in this session . Our field facilitator volunteers Towfique Anam Rine , Porag Das and Nafiul Pantha helped out the participants . 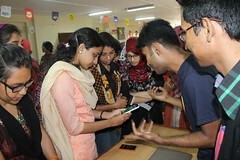 The participants were given ideas on how to develop a firefox OS app , the prerequisites to develop one , WEB APIs , Firefox Marketplace etc . After successful accomplishment of the technical sessions we provided them with some cool swags (i.e. Firefox logo t-shirts , wrist bands , webmaker t-shirts , stickers , badges etc). All the participants were really excited and happy to receive those swags !! On Receiving Cool Swags and T-shirts !! Then with the evening snacks we concluded the whole event in the wrap up session. The impact of this tech fest is not just finished yet with this time frame but it will measurably increases women’s confidence and knowledge in open technology and culture cautioning them about their privacy in web – in an environment that more often pushes women towards the door. Also it both empowered young women in our country to take up the challenge and gave them some primary idea to get started with . 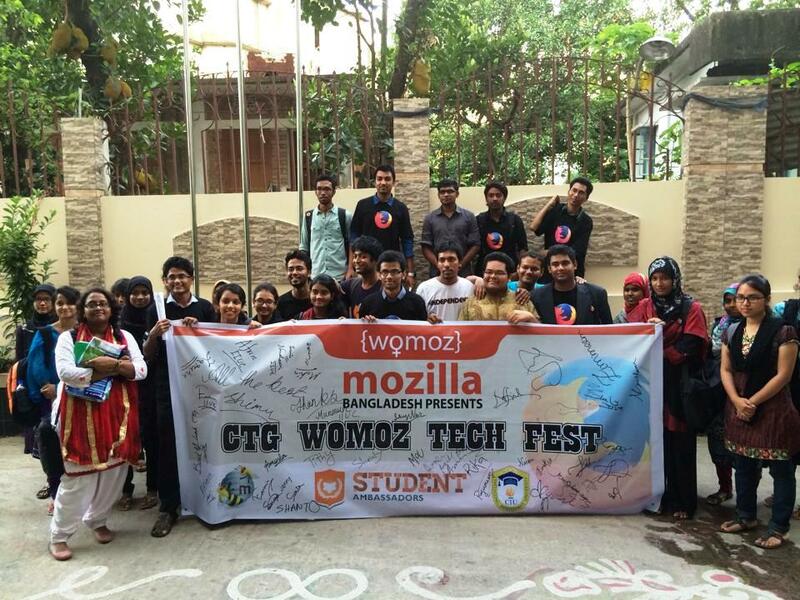 Participants wishing best of luck to CTG WoMoz Tech Fest ! 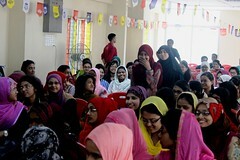 Enthusiasm of the participants was praise worthy . Later on in the interactive part of the wrap up session participants expressed their thought on carrying on the open web loving trend among them . We were able to recruited more womozes , created a womoz buzz in the region , made them aware of our path ways and mozilla’s mission , tools promotion. In a word we achieved our success metrics quite well ; better then we expected actually ! Heros Who Worked Behind ! When I initiated the plan of divisional tech fests leading to all female national appathon i knew a little and wasn’t sure if this was even possible to accomplish . Lots of uncertainties , problems and issues were there to deal with . Even at a point i got demoralized that “let it be … i can’t do this” but thanks to our community lead Mahay Alam Khan and local reps Rahid Hasan , Ashickur Rahman Noor , Mashkawat Ahsan , Tanha Islam , Belayet Hossain , Shafiul Azam , Aniruddha Adhikary , Ratul Minhaz who helped me a lot through out the journey to organize such an event as a kick start . 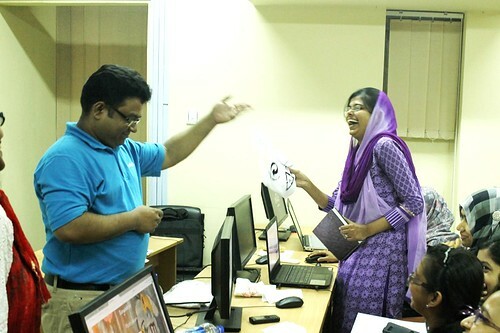 The enthusiasm and support of CTG’s local mozillians and FSAs Fahria Kabir , Nishat Rihana , Romana Momtaz , Rakibul Hasan , Towfique Anam Rine , Shamsuzzaman Sadi , Abdul Mannan Asif , Porag Das , Navid Ahsan , Raju Meaji , Shahadat Hossain Riyad , Farhana Tonni , Naima Sultana , Nafiul Pantha , Akramul Yeasin , Sakir Sazzad , Tanvir Chowdhury , Muslim Uddin Sumon , Roman , Sumi Khatun , Tahmina , Farzana Iqbal , Zimmeem were really praise worthy too. Our Event Hash Tag : #CtgWomozTechFest | Newspaper Coverage  here |Newspaper Coverage  here | Blog post from one of the volunteers  here |Blog Post from one of the participants  here | A few participants Response  here | Link to the Photo Album :  CTG Womoz Tech Fest Flickr Album | Event Detail  Here in Reps Event Portal | One of the developed apps  here.